The local authorities’ elections is long overdue. What are the reasons for such an inordinate delay? There are three factors that matter in conducting these elections. Actually, the reason is not the introduction of the mixed election by enacting a Bill in 2012. The Bill was signed into an Act in 2012. Yet, it became operational only in 2013. 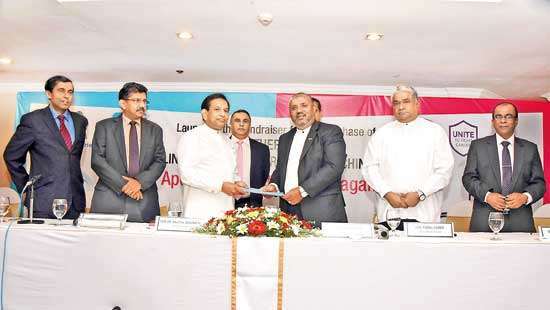 After it was signed into an Act in 2012, a National Delimitation Committee was appointed. While the committee’s work was in progress, the Act was made operational in 2013. By that time, the elections were overdue even for some local bodies constituted after an electoral process in 2008. We could have conducted the elections under the old proportional representation system. But, it turned impossible after the subject minister at that time made the Act operational in 2013, providing for the elections to be conducted only under a mixed system. That is the starting point of this delay. By 2013, the term of the Vavuniya Urban Council expired. The term of the Jaffna Municipal Council had expired at the time. It was extended for a period of one year. In the meantime, the delimitation committee worked out its report. In January 2015, the new government came in. There were objections to the recommendations in the report. Then, the new minister appointed a committee to address them. It is not the Asoka Peiris committee. It was a different one. Present Speaker Karu Jayasuriya was the Minister. After that, the new committee submitted its report on August 21, 2015 to the President. He gazetted it. Then, only we became aware of the electoral wards created. We received the gazette notification in October the same year. Then, one would ask why steps were not taken in October to conduct the elections. Actually, what are those reasons? Apart from the creation of electoral wards, there is yet another factor that matters. Apart from the Local Authorities’ Elections Act, there are three other laws governing elections to the local bodies - the Municipal Council Ordinance, the Urban Council Ordinance and the Pradeshiya Sabha Act. These three laws provide for the constitution of local bodies by the subject minister issuing a gazette notification. In this gazette notification, the boundaries of local bodies and the number of members representing each of them should be announced. This gazette notification only gives the legal effect to the local authorities. As long as this is not done, we cannot conduct the election. In the formulation of the new election law providing for the mixed system, the then Elections Commissioner, starting from 2010, submitted recommendations to be incorporated in it to avert practical concerns in conducting polls. Little attention was paid for it. When this Act became operative in 2013, I, as the Elections Commissioner, informed the authorities concerned of serious flaws in the Act. One was related to the authorized agent of a political party assigned for the handing over of nomination papers. In the new Act, there is no interpretation of it. The authorized agent or the party secretary could hand over nomination papers as mentioned in the Act. Yet, who is this authorized agent? It is not interpreted. There are minor discrepancies and we have identified 56 such shortcomings altogether. 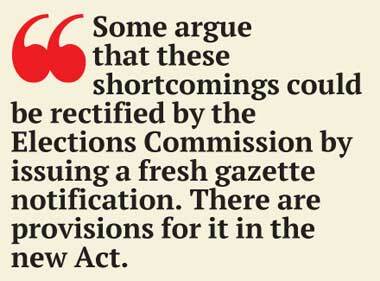 Some argue that these shortcomings could be rectified by the Elections Commission by issuing a fresh gazette notification. There are provisions for it in the new Act. I believe only the judiciary should rule over it. The gazette notification should be issued to constitute the local bodies with the specification of boundaries and the number of members. Then, there is another Act No. 1 of 2016 providing for the reservation of 25% of the slots for women. That too has to be gazetted by the Minister. The mere creation of electoral wards will not suffice for conducting the election. We cannot play the match merely by having the stadium only. We need to have the wickets in place, boundary lines have to be laid, scoreboard has to be installed and we need a dressing room as well. In this instance, the ground has been levelled and grassed sparsely. As the Elections Commission, we can organize the matter, however, Parliament and the government for that matter have to prepare the turf, the wicket and everything. What are the initiatives you have taken to prevail upon the government in this regard? We have written to all those concerned repeatedly and informed the political parties. We do not find them keen to address the outstanding issues. 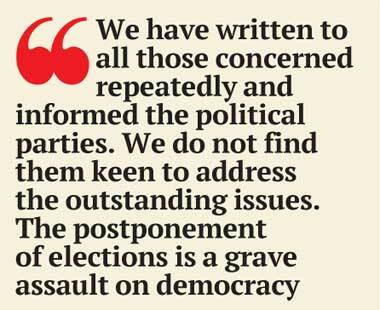 The postponement of elections is a grave assault on democracy. It is a right enshrined in the Universal Human Rights Declaration. What are the other serious defects in the present law for conducting the election? We have a serious issue in counting postal votes. The new Act provides for centralized counting. It means counting has to be done at the polling booth itself. For an electoral ward, there may be five postal votes only. Then, if all those votes were for a single party, their identity would be revealed virtually. So, we need a mechanism to mix up normal ballot papers with postal ballot papers before counting. Then, identity of postal voters could be preserved. Another aspect is that the polling staff have to be assigned for counting too in terms of the Act. The staff could be replaced only if there were objections from the polling booth agents. In certain instances, we find polling booth agents representing only one party in the fray. If they do not object, we would not be able to replace any staff member even in the event of his misconduct. However, there is perception in the country that elections could be conducted as per the Asoka Peiris Committee’s submission. What are your views on this? They hold talks with us. Yet, they are critical on us. It is regretful to note that some politicians are being critical of the Elections Commission for political ends. We are not able to counter every remark by politicians. In that case we are helpless. Wherever we go, be it a funeral or a wedding, those present approach us and ask why elections are not conducted. The reason being, giving legal effect to the new election system. Another reason is not addressing other shortcomings. How prepared are you to conduct the elections in case these issues are addressed? We are always ready to do it. We are ready for it. The terms of three PCs will expire this September. There is a talk about plans to postpone elections. How do you respond to this? Or else, fresh legislations should be brought before Parliament to introduce a new election system. A postponement could be sought till the enactment of such legislations. Our view is that the elections should not be delayed. The Supreme Court has ruled that any electoral process is linked up with the franchise of people. 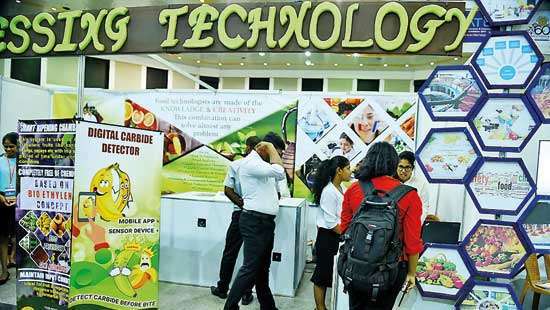 Franchise is linked up with sovereignty in terms of constitutional provisions. People’s franchise is compromised in the event of postponement of elections. In case the election is postponed, one may go to court. Then, the Elections Commission will give its opinion to the court that such postponement is an affront to people’s franchise and democracy. We, as the Election Commission, cannot go to court on our own. But, we could express our view. If the election system is to be changed, the elections pending have to be conducted under the existing system during the interim period rather than postponing. As for the LG elections, we are in a deadlock. Actually, it is not postponement though some people call it so. 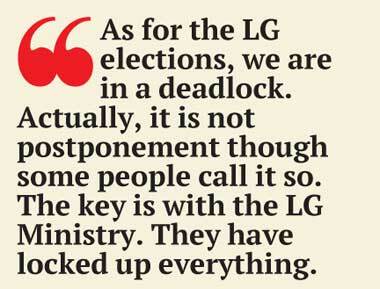 The key is with the LG Ministry. They have locked up everything. They have the responsibility to act. They have to issue two gazette notifications. What is your view on dual citizens being barred from seeking seats in Parliament? It is a matter now before court. It is not appropriate for me to comment. 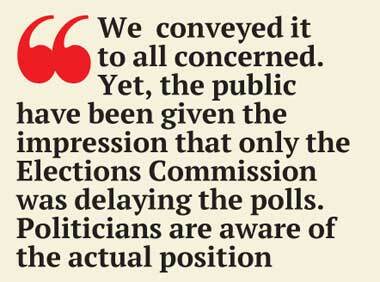 What has the Elections Commission got to say? We have to say one thing. A lot of people ask whether it is possible for the elections authorities to reject a nomination list containing the name of a dual citizen. Nevertheless, we could reject a nomination list in conformity with provisions of the Parliamentary Election Act. It has outlined specific reasons to be considered in rejecting a nomination paper. The Act says , “Rejection of nomination papers. (d) where the consent of one or more candidates nominated or the oath or affirmation, in the form set out in the Seventh Schedule to the Constitution, of one or more candidates, has or have not been endorsed on the nomination paper. (e) where the signature of the secretary in the case of a recognised political party, or of the group leader in the case of an independent group does not appear on the nomination paper or where such signature has not been attested as required by subsection (3) of section 15. (1A) Objections to a nomination paper may be made to the returning officer between 12.00 and 1.30 in the afternoon of the last day of the period of nomination, and no such objection shall be entertained by the returning officer after 1.30 in the afternoon of that day. (2) Where any nomination paper has been rejected by the returning officer under subsection (1), the returning officer shall inform the secretary of the recognised political party or the group leader, as the case may be, who had submitted such nomination paper the fact of such rejection. The decision of the returning officer to reject such nomination paper shall be final. It is regretful to see a debate in this regard. 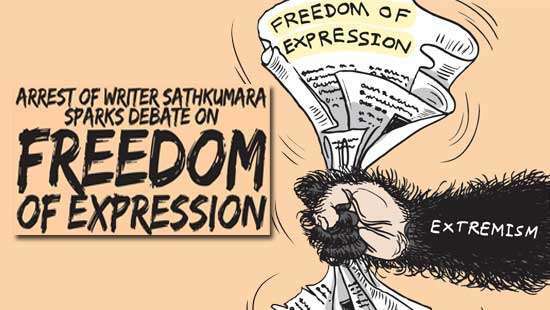 We cannot dispute the eligibility of Geetha Kumarasinghe to become an MP or her dual citizenship because it is a matter before the courts now. Apart from these; for any other reason; a returning officer cannot reject a nomination paper. He can do so on ex facie evidence only. He cannot have any inquiry. We are amazed to note the emergence of such a debate. The law is clear in this regard. Our Additional Commissioners also released a communique clarifying this. What are the plans being made by the Commission to improve voting rights of people? We have sought arrangements to enable anyone to vote as soon as he/she completes 18. Today, though you complete 18, you cannot vote till you become 19. That is due to the only annual registration of voters, because it takes one whole year. If an election is declared today, only those registered with the 2016 list could vote. It means only those born before May 31, 1998 can vote. They should be more than 19 years old, not 18. We propose to prepare supplementary registers within every four months after the annual registration is done. That is for the benefit of the youth. It should be introduced as legislation to be enacted by Parliament. We have submitted yet another proposal. There are polling stations inaccessible to voters with disabilities. For example, a voter confined to wheelchair cannot ascend steps to reach polling booths. We need arrangements be made to deliver him a ballot paper where he waits. We also propose to reserve one fifths of slots for woman office bearers in a political party. We seek arrangements regarding details on election expenditures to be submitted to us by candidates and parties.